Discussion in 'Mech Tech' started by bluerustybucket, Oct 8, 2018. They are possibly one of the easiest mods you can do. They are pretty much a self contained unit. If you can do up a jubilee. clip, drill an hole and follow simple instructions, then you can do it. The most important advice I will give though is, the exhaust has to work properly and vent out away from the van without leaks of any sort that might allow smoke back into the van. Get that bit right. Other than that there is a Facebook group called planar heaters, I'm sure he would fit a Chinese night heater for you. Or go to techenders and ask for help to do it. scrooge95, Valveandy and Lasty like this. Any idea how? I've joined the fb group but haven't been approved yet. I know how to switch it on and off but that's about it. The right hand red led on the heating scale does come on though. I'd like it to work as a thermostat but haven't worked out how yet. Which did you buy @Louey and was it the full kit? This is the finished system. I've turned my fuel can in to a tank with a breather. Uncle Nick and Louey like this. Mine just arrived via royal mail.. all intact, everything in the box, just as ordered. Ebay, million billion .. £127 all in .. 10 litre fuel tank is a bit overkill so probably will look for a smaller alternative . Look forward to fitting it in the spring . Jut in time for the new ice age..
Any current links to full kits people have used? There seems to be loads of different kits / sellers. It is a bit of a lottery at the moment. Basically there are two types of dimensional units 2kw and 5kw. 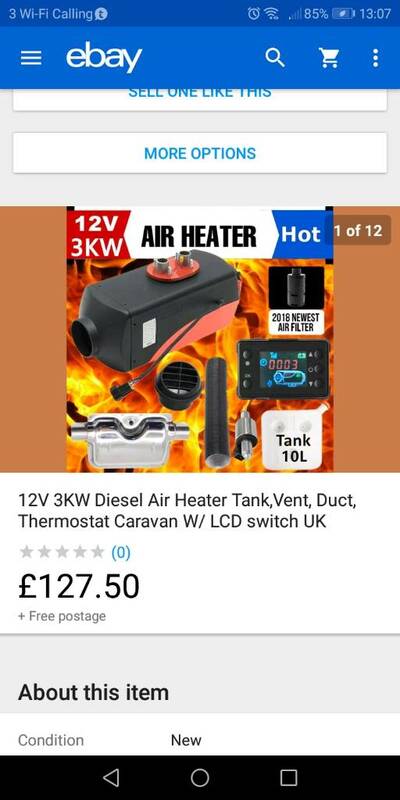 The 2kw is a smaller dimensionally unit more easily fitted if space is at a premium and we don't really need much more heat output in our vans. But they can supply 5kw units derated too 2kw or 3kw. You are not always sure that you will get a 2kw or 5kw size if you order a 2kw heater as the true 2kw seems to be the most popular and is in short supply so they send a low output 5kw or even just a 5kw. I ordered a 2kw from millionbillon on Ebay and recieved a true 2kw in 8 days, I ordered another 2kw from industry village on Ebay and received an actual 5kw unit in four days. Red Diesel is white Diesel with a red dye for off road use and less tax but still 10ppl more from my supplier Tonbridge fuels. 60p a litre for me, I get it from a heating oil supplier and they have standard fuel station style pumps. Yes, it's in the garage / workshop. I could do with one a bit bigger really as it's not insulated. I've been told 2kw is enough for a van but if I do get a 8kw I'll swop the 5kw to the van and open the windows. 5kw is a lot of heat. Louey and Lasty like this. I get it from a heating oil supplier and they have standard fuel station style pumps. Mine came from million billion. No problems. Man leggings from M&S. "the true 2kw seems to be the most popular and is in short supply"
The 2kw is size 32.5 x 11 x 11cm - anyone have good a link to one as the link I had has changed to the 5KW size. By the way where is that? Trying to build a database where small quantities are available from the pump. Filled my tank today cost £4.60. The last time I filled it was Feb 2nd last year. Used it quite a bit too.